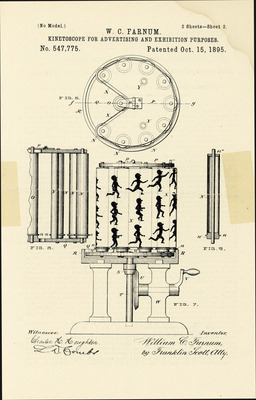 "Patent #547,775, Advertising Kinetoscope, 1895"
Patent #547,775, original printing, U. S. Patent Office, Patented Oct. 15, 1895. Kinetoscope For Advertising and Exhibition Purposes. William C. Farnum, of Arlington, Vermont. Application filed September 26, 1894. Serial No. 524, 146. 2 diagram pages and 3 text pages. (No model.) Page two diagram sheet.